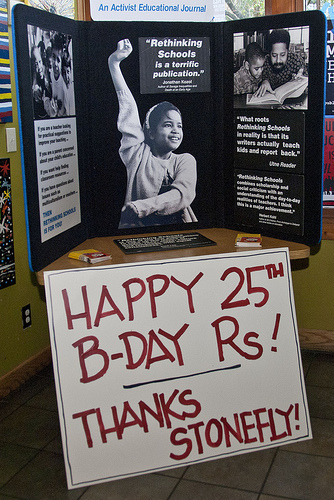 Last Saturday, Rethinking Schools friends and supporters from the Milwaukee area (and a few fine folks from Chicago) had a rollicking good time celebrating 25 years of teaching for social justice. And, in typical Rethinking Schools fashion, we stirred up some controversy with our event. Dr. William Ayers—teacher, activist, award-winning author, and retired professor from the University of Illinois-Chicago, accepted our invitation to be our keynote speaker. 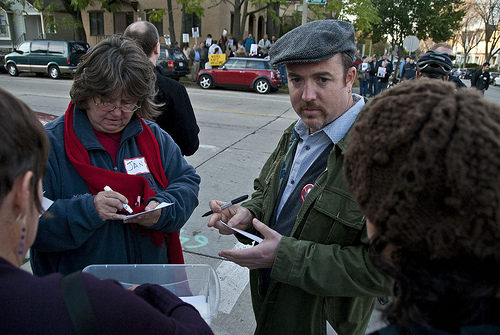 News like that doesn’t escape the fury of the right-wing tea party activists in our town, so area radio pundits raised hell on the air, their followers responded with nasty phone calls and e-mails, and our first location backed out on us. 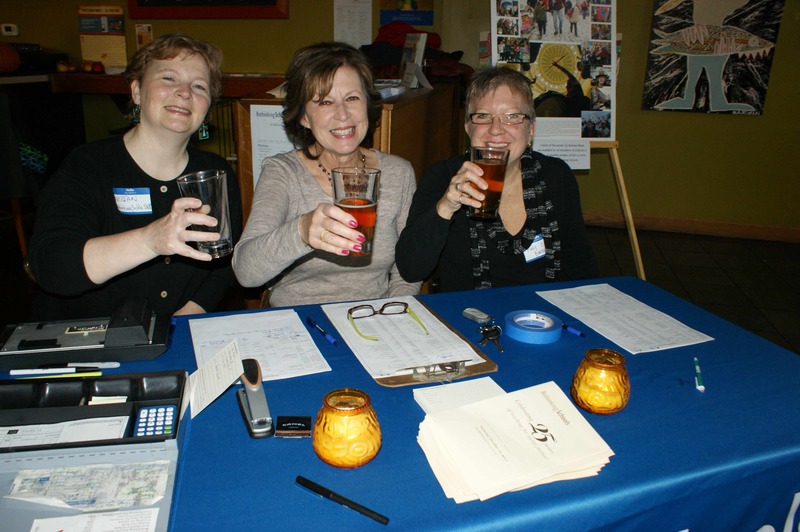 Luckily, neighborhood business Stonefly Brewery happily agreed to host our event. In fact, at one point they said the attack by the right-wing radio hosts would give them “street cred” in the neighborhood (yeah, it’s a pretty cool neighborhood), but that was before the harassment escalated. They were furious at the tea partiers for their baseless accusations. Despite hundreds of phone calls and letters in the weeks leading up to the event, Stonefly hung with us, and helped us throw a great party. The tea party radicals weren’t going to back down without a fight. They came to our event to protest. Perhaps 40 of them came to the event and planted themselves across the street from Stonefly with their signs. They just sort of… stood there. But the neighborhood and our own designated peacemakers stood with Rethinking Schools and ensured our guests arrived without incident. We showed ‘em what solidarity looks like! Our Rethinking Schools "peacemakers" were getting to know one another as protestors gathered across the street. And some of our supporters even had a little fun with it. 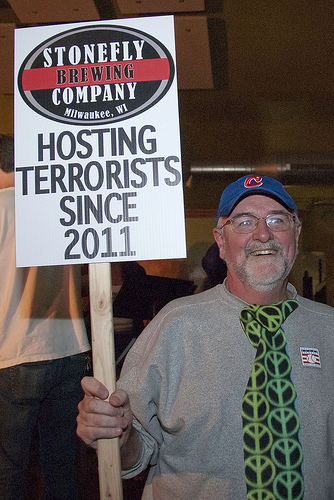 Supporter Will McGraw bought this sign from one of the protestors for $10, and gave it to the owners of Stonefly as a souvenier. I don't think he paid for a drink the rest of the night! Members of the staff and the 25th Anniversary planning committee warmly welcomed all of our guests. Tegan Dowling, Sandra Orcholski, and Mary Barrett were on our "welcoming committee." It was a beautiful thing to see our supporters flood the room. 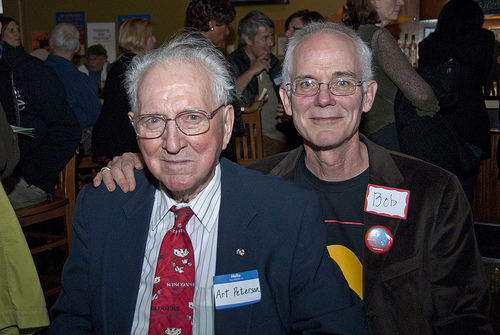 Bob Peterson with his father Art. 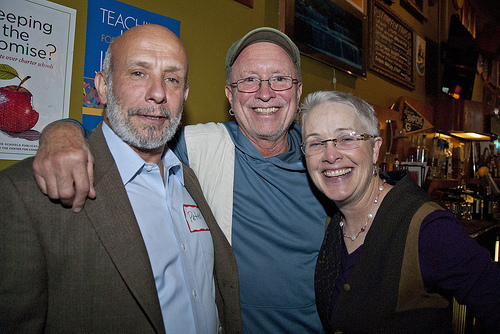 Peter Earle, Bill Ayers, and Barbara Miner. The music provided by Catherine Capellaro and Andrew Rohn warmed up the crowd (the cash bar didn’t hurt, either). 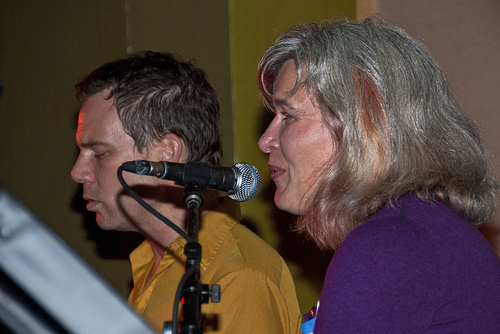 Catherine Capellaro, former Managing Editor for Rethinking Schools, and Andrew Rohn provided music early in the evening. The rousing program was fun and inspiring. 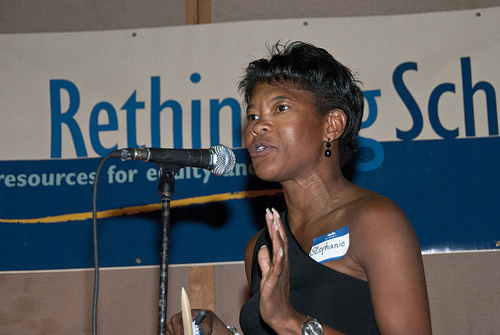 Editor and activist Stephanie Walters effusively welcomed attendees and moved the program along. Rethinking Schools editor Stephanie brought enthusiasm to the role of emcee. 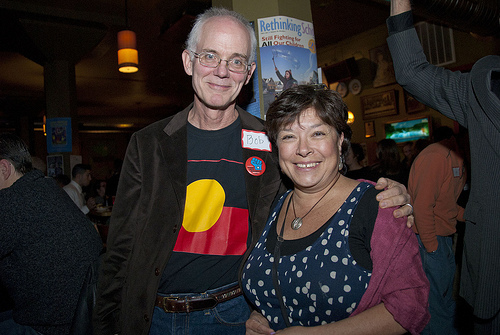 Co-founders Rita Tenorio and Bob Peterson shared a bit of Rethinking Schools history. Bob Peterson and Rita Tenorio. Two of the original founders of Rethinking Schools. 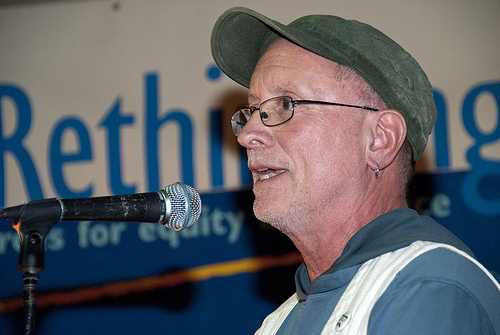 Bill Ayers delivers keynote speech. I’ve not been part of the Rethinking Schools staff and community for long, but I’ve never felt more proud to be a part of it than I do after participating in (and partying) last Saturday night. Please support this valuable organization as you’re able. Donors who gave $250 or more received this beautiful poster created by Barbara Miner. 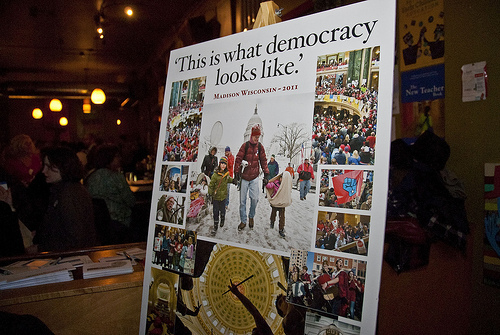 The photos depict the historic protests at Wisconsin's capitol in Madison in February 2011. After Bill finished his talk, Larry Miller came to the stage with Maya and Masami, daughters of editor Melissa Bollow Tempel, to ask for financial support. Not surprisingly, Maya and Masami stole the show. 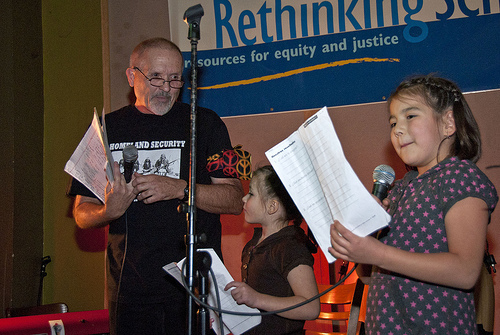 Rethinking Schools editor Larry Miller solicited assistance from Maya and Masami for our closing remarks and fundraising pitch. They stole the show. The event ended with more music from The Living, comprised of neighborhood folks who donated their talents for the evening. Stonefly Brewery for being a great neighborhood establishment and putting up with harassment to host our event. Susan Ruggles for taking amazing photographs during the event. Stephanie Walters, Rita Tenorio, Bob Peterson, Larry Miller, and Maya and Masami Tempel for their speaking roles during the program. Bill Ayers for an inspiring keynote speech. Melissa Bollow Tempel and Kathy Xiong for being terrific spokespersons for Rethinking Schools with the media. Musicians for sharing your talent so generously: Catherine Capellaro, Andrew Rohn, Jim and Char Guten, Stuart Dove, and Mauricio Alverez Torres. 25th Anniversary Planning Committee members, but especially Tegan Dowling, Sandra Orcholski and Mary Barrett, who were our unofficial welcoming committee. Mike Trokan, staff, and our editors who have made Rethinking Schools the treasured “movement-maker” it is today. Posted on October 21, 2011 October 24, 2011 by Rethinking Schools	This entry was posted in Uncategorized. Bookmark the permalink.